This is a free preview of my 6th Grade Math Intervention Binder and includes intervention practice pages for Subtracting Decimals and Area of Triangles. What is the math intervention binder? 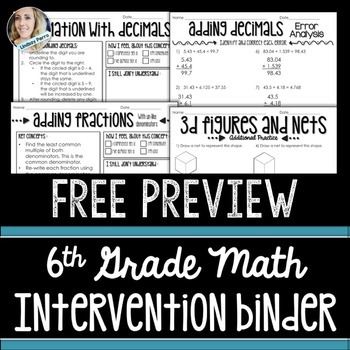 This 6th grade math intervention binder is designed to provide extra practice resources for 6th grade math students. The worksheets are not meant to be used for full class lessons (although they could be if that is your preference). 55 different skills are included in the intervention binder. **Tracking Sheet – Record the dates and scores for each activity. **Review Sheet – A quick review, student input section and problems intended to be used as guided practice. **Practice Worksheet – Use as independent or partner practice. **Error Analysis – Each problem is solved incorrectly. Students identify the error(s) and then solve correctly. Also included are small group planning sheets and overall intervention tracking sheets are coming soon! Where can I purchase the entire binder? If you are interested in signing up for my email list and getting a free set of stations, CLICK HERE.